These teams aren’t necessarily a star player or two away from being juggernauts. But they each excel on the offensive end of the floor. Improve their defense, and they’d be up there with the best squads in college basketball. Purdue was as hot as any team in the country until it stumbled against Maryland on Tuesday. 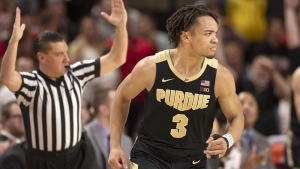 Watch them, and you might be concerned that the Boilermakers don’t have enough guys to help Carsen Edwards carry the scoring load. But the numbers say that hasn’t been a problem this season. Purdue ranks fourth in offense, per KenPom, and the Boilermakers use a combination of tidy 3-point shooting and low turnovers to remain efficient. Defense has been the issue this year. Purdue ranks 63rd on that end. Matt Haarms is an excellent rim-protector, but the Boilermakers’ 3-point defense is poor; opponents sink 36.2 percent of their 3s against them. Edwards and Ryan Cline are one of the best offensive backcourts in America, but neither is a defensive ace. Nojel Eastern is a defensive ace, but isn’t much of a factor on offense. The Boilermakers are good, but they don’t have a ton of two-way players. We’ll see if their guys can make strides on one end or the other down the stretch. The rebounding numbers are surprising when you realize LSU has Naz Reid and Kavell Bigby-Williams, two big and athletic guys who should be able to thrive in that area. But Reid’s skill is more impressive than his physicality, and the Tigers are small outside of him and Bigby-Williams. The last time LSU scored less than 70 points in a game? Nov. 22 against Charleston. These guys are fun to watch, and the defense isn’t bad. It’s just ‘fine.’ Perhaps the Tigers have another level in them. The problem? They take a ton of risks and often get burned by them. Auburn ranks 223rd in opposing 3-point field goal percentage; that’s a function of being out of position on a regular basis. If the Tigers can find a happy medium and be more disciplined while still bothering opponents, perhaps they can regain their early season form. Villanova is about as good as we expected at this point in the season, record wise. But it’s surprising that the Wildcats rank 10th in offense and 77th in defense. With Jalen Brunson, Mikal Bridges, Donte DiVincenzo and Omari Spellman leaving, the offensive firepower was expected to take a hit. But it was worth putting faith into Jay Wright’s defensive infrastructure. But Villanova has been just fine on offense, even if it doesn’t look as pretty as last year. Phil Booth and Eric Paschall have stepped into starring roles after inconsistent starts, but losing Bridges and Brunson really hurts on the defensive end. Collin Gillespie and Saddiq Bey have been solid. That said, they aren’t disrupting offensive gameplans. Paschall was an ace defender for that title team, and his defensive abilities haven’t vanished. But it’s not as much of an emphasis for him considering the offensive load he now carries. The Wildcats don’t have the athletes to become an elite defense, but they can be better than 77th. If they can shoot up into the ’40s, or so, look out. Believe it or not, Iowa ranks seventh in offense. The Tyler Cook-Luka Garza frontcourt pairing is absolutely lethal. Garza is averaging 24.3 points per 40 minutes, while Cook is a double-double threat every night. The Hawkeyes surround their skilled bigs with shooters. That’s a recipe for a potent offense. But the defense ranks 115th, and as good as Cook and Garza are on offense, they aren’t the most fleet of foot defensively. And that extends up and down the roster. Iowa is skilled, but limited athletically. They don’t force many turnovers, and while the 3-point defense is solid, the Hawkeyes really struggle to contain dribble penetration. Opponents make 53.1 percent of their 2s against Iowa, meaning it ranks 286th in 2-point defense.